According to Duncan White’s review of this book in the Telegraph, in January 2006 when Teju Cole returned to New York from his first trip home to Lagos in 13 years, he wrote about it in 30 blog posts in 30 days. The result, a fictionalised mixture of memoir and reportage, was made into this his first book which was republished in 2014. I had not realised this until after I read the book but his writing had come across to me as so real and personal that I had to check whether it was an autobiographical account or not. 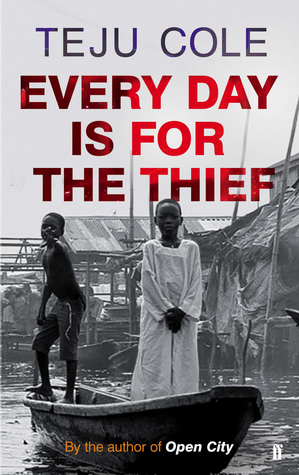 One of the two quotes at the front of the novel is the Yoruba proverb Ojo gbogbo ni t'olw, ojo kan ni t'olohun Every day is for the thief, but one day is for the owner. His descriptions of the "graft" or bribe system are very familiar to me having lived in Abuja through 2012-13 from the soft to the more forceful examples of this form of social lubrication in action and how its continued existence perpetuates the patronage society, easing passage and maintaining hierarchies in government, business and every day life, from him getting his passport renewed at the Nigerian Consulate offices in New York, to witnessing 419 scammers of advance fee fraud - the yahoo-yahoo boys in action in the internet cafes of Lagos, to the hiking up of petrol prices at those pumps which have it to sell, to the copy shops selling copies of CDs, to policemen and unofficial toll booths operatives with their AK47s stopping motorists for on the spot fines and tolls. His account covers so much of what I recall from my experience in Nigeria from the day to day existence, the power outages, the continual multiple generator noise, its tribalism, its poor education system exemplified in his account by the story of the well respected boarding school teaching its students that a humanist is someone who does not believe in God. I am glad to say I never witnessed the fatal frenzy of a market attack and necklace killing of a 11 year old thief, nor had to talk down a violent request for money and we never had our house broken into albeit that our gate-boy and our neighbours were attacked and locked in the gatehouse as armed robbers stormed our neighbourhood. Cole had clearly wondered whether he could return to Nigeria and write there, seeing it as a treasure trove of characters and stories but was also depressed by its stifling of the creative juices. Even where he found emerging creatives such as MUSON Centre he found, at least in 2006, that lessons with “oyinbo” teachers were more costly than those with African teachers and students were expected to own their instrument of choice. Whether this has changed I cannot say but his futile search for literature books in the Lagos bookshops was by 2012 much altered at least in Abuja with Cassava Republic, albeit that the cost of books (e.g. 800 – 1500 Naira for a paperback novel) would still be prohibitive to many an ordinary Nigerian. Cole’s conclusion that “tokunbo” (foreign imports”") + “idea l’a need” (the concept of just doing enough to get by, to make do) + corruption is what limits Nigeria, what stifles Nigerian creativity I can relate to. The country does not make, it imports; it does not foster ways of thinking which lead to the development of the things it imports; and does not engender in its people attitude of attention to detail needed for an enquiring and investigative engagement to the creative and scientific spirit behind what the things used. Spot on Mr Cole! ashramblings verdict 5* I have to give this book 5* as a second to none best introduction to the Niaja predicament – no solutions but a clear picture. You are spot on with the mix of reality and fiction. Myself I read it almost as a memoir/travelogue.